I returned to London to settle up my accounts and then again journey to Torquay - about Easter 1945. I took over the manager's job at a small cinema in Teignmouth. I fancied the town and I thought it would be fun. I soon thought differently. There was no relief allowed that meant that I was there every hour of the day. We were offered a flat above the cinema but my wife objected - owing to there being only one way of exit through the cinema itself whilst the windows were screwed up and could not be opened for fresh air. After a few weeks, I resigned and then I took a flat at Ivy House - on the front - with the intention of staying in this quaint old town. At the advent of the autumn, again I have an offer from Harry Benet - to manage a small circus and this took me over Christmas to the spring. After which I again reside at the seaside in Bournemouth. Twelve months had elapsed when Lew Marks asked me to meet him in London with a view to managing a production for Jack Payne - that magnetic and fabulous character - who some years previous blasted a name which will be handed down to posterity as a leader of band leaders. To London again - where everything seems very quiet. I have an appointment at 11 a.m. to see a Mr. Frank Barnard. At 1 p. m. I have a short chat and call again during the afternoon. At 3 p.m. Mr. Barnard (who was the General Manager to Jack Payne) gave me another brief talk - no decision. However I have a wire at my Catford address to go to the New Cross Empire and take over the show called "Navy Mixture" at once. This was on a Friday. On Saturday I saw the production. On Sunday I journey to Plymouth - with the company opening at the Palace Theatre, Plymouth. There is a letter awaiting me from Jack Payne's office - advising me to buy new bunting for dressing the ship scene. A complete overhaul was needed. I had only a very brief contact with everything at New Cross Empire - to discover in its entirety, all cues, distances and the intricate lighting which "Navy Mixture" incurred. However, my first performance was perfect. My next - a fly man made a mistake - otherwise it was a perfect week. Here are a few words about any back stage staff - that may be at any theatre. The stagehands job is a part-time occupation. Their major job maybe the factory- or a tradesman shop. I am alluding to the extra help that is needed to set and strike the scenery. Some of these men and their families have worked behind the scenes for years - even generation after generation - but when the war came about - the men were needed on jobs of national importance. The face of the town was altered - by the bombings - and a new type of men were drafted into the ranks of stage hands, fly men, props and dressers. Unfortunately, the local stage manager could not pick or choose - he was obliged to accept anyone who offered a service. Should a production have a fast working show, some of them demonstrate their resentment - by either "going slow" or miss a scene - sometimes a vital and important job -for perhaps two minutes. This holds up -collectively -the whole scene and the blame is on the local and touring stage manager. The love for the theatre - concord and harmony - with these men is not to be compared with the staff that existed before the war. Therefore, the touring productions of today are definitely only a shadow of their pre-war counterpart. This actually occurred in America directly after the first world war - for the great circuit of theatres in the U.S.A changed their policy - converting to pictures. I hope this will never happen here. Leaving one great seaport town to again visit that great companion port on the Mersey Liverpool. At the Empire Theatre, I am happy to say that our show "Navy Mixture" was never better staged - and it was a complete success - not a single hitch-up. This is no overstatement - for instance, we carried a false proscenium as an inset. The "pros" opening at the Empire is abnormally large - about forty-eight feet. Should I have chosen to keep this "false pros" set, the patrons on each side of the fauteils would be out of the sighting line. I therefore "flew" the whole of this proscenium away - this allowed the ship scene to be in view from any part of this great house. This happens twice during the progress of the show. During the week, the members of the company were invited to a dance on one of His Majesty's Men of War ships - which anchored off Liverpool. Billy Scott Coomber, who was one of the members of Jack Payne's band some years ago (he was playing with his own revue at Birkenhead) during our week at the Empire, Liverpool. He rehearsed the act known as the "Singing Sailors" and one of this team was late for one of the rehearsals. I reprimanded him - his reply was - that he did not like rehearsing - that he could do it in his sleep ! My answer was that though one was perfect, it did not mean that libertys should be introduced. Also that a rehearsal was the combination or associative business, and it was not an individual affair. Team work is the key note of a successful result. One of the best variety stage managers - with a comprehensive knowledge unsurpassed - was the chief in charge at the Empire, Liverpool, Cliff Clifford. The week following Liverpool was vacant. The company travelled to London but the scenery and properties went to Brighton - and there it was stored at the Hippodrome, Brighton, until the succeeding week. As was the usual custom, half salary was paid to the staff. Brighton, without the ban, has gradually restored itself - for it has a magic and captivating look that arrests every beholder instantly. The scene from West Street, near the station, is like looking through a keyhole - and then the door opens, to view a scene of the gayest seaside resort in the south. I will give you a resume of our artists engaged in "Navy Mixture". Norman Wooland - a star in his own category - the legitimate stage - also on the radio. He was a great draw. "Huber" Jack Watson - he too could hold his own and was a big box office attraction. Son of a popular father - Nosmo King and he walks in his footsteps. Vic Wise - the comedy was in safe custody with Vic for he was never better. The hokum comedy was enjoyed by Pop, White and Stagger - a very safe bet - for obtaining "belly laughs". Sunny Rogers - our little soubrette - a favourite of everybody. Her radiant smiles, coupled with her dancing and rope routine brings a tornado of applause. A short journey to town and I am back again at Chiswick Empire. Our show here again was without incident, except that it was its usual success. In fact, this production was labelled "a money spinner". We had many of those rehearsals which the actor does not like - however, when a little slackness occurs, it is the only remedy. Jack Payne was putting out a "Forces" programme including a Mrs. Mopp series. This too was rehearsed by Lew Marks. At the Chiswick Empire, a new back cloth for the ship scene by "Erik." I myself was not in favour of innovation - the detail of the original setting was more defined. Now we travel to Leicester - to the Palace Theatre. The (get-in) here is down a long passage, the scenery is carried by relays of men to an unloading dock. Perhaps some day - a lorry-like contrivance that will take 18 foot flats will be instituted - thereby a saving of labour. I am sorry - here I have made a mistake in the running order of dates. Leicester came after Bradford. Leicester Palace was not up to my expectations but the local manager said he was very satisfied. As I have no actual record of the sequence of dates, I shall take an incident that shows most interest for my readers. 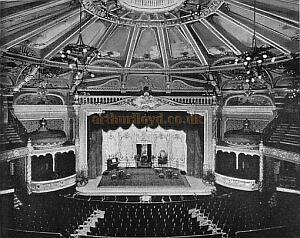 At the Alhambra, Bradford, my young electrician - who worked a dimming board - was very obstinate by fixing his board at the end of a track where a set of ships rails was manipulated (by a stage hand) at each side of the stage. The first night, the prompt side rail travelled about six inches too far - thereby colliding with the dimmer board. A short circuit - with a huge flash - and we were left in darkness. It put all the lights of the theatre out. However, the local electrician was able to give us a skeleton supply after a short interval. Here I must refer again to Leicester. After the last performance, rain was teeming down and my stage manager, George Mathieson, who supervised the loading at the station of the scenery and effects, reported to me that the staff of the railway unloaded all this scenery, wardrobe, electrical apparatus and properties into some other trucks, owing to a wheel "running hot" - but the porters could not get it all in (as it was not expertly handled) and two more trucks were added. On arrival at Bradford, the breakages were colossal - especially the electrical equipment. I feel that the above incident had some connection with the blowing up of the dimming board. I think the Palace, Manchester, was our next date. This Palace Theatre has been re-built a few times and its history goes back many years. It is a gorgeous theatre and is fitted with a stage that can accommodate the largest productions. There is only one snag - the heating appliances or installation - it is supplied from the local borough's electricity plant. During the winter months, the stage and the dressing rooms are nicely heated but in the summer - it is just the same ! There seems no method of by-passing this never ending supply of hot water. 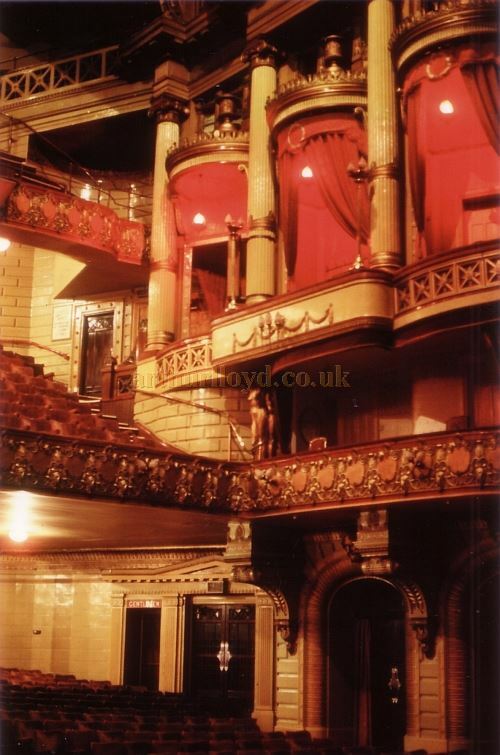 Right - The auditorium of the Palace Theatre, Manchester in 1978 - Photo Courtesy Ted Bottle. We again play to as near capacity as possible. From here we are due at the Palace Theatre, Reading. We are to open with a matinee on the Monday - as it is Bank Holiday. I ordered my "get-in" at 3.30 Sunday afternoon then to set up as much as possible - everything was timed and all went well. I am handicapped by a very small stage - and everything associated with this theatre is opposite to nearly every other. For instance - the prompt side is controlled from the O.P side - although the fly bell is on the P. S. The electrician works a board adjacent to the O.P. Lime Perch. The speaking tube or connection to the orchestra is on the P.S. As you are aware -two ships rails -fifteen feet long -with a five foot extension - operate - sliding on and off stage - at the opening and closing of each scene. As the distance from the edge of the proscenium (line of sight) is only six feet - it was impossible to try and use it - as it was intended - that is to meet exactly in the middle. So for this week I had to improvise - or cut the rails down. This meant that when re-assembled - it is never the same. We have one scene - a crows nest with a mast built on a boat truck. This has two levers to make it rock. This stood,, when built, 22 feet 6 inches high. We were often in trouble with this piece of scenery because - if the underneath of the "fly floor" was at this height or less, the stage hands could not get it out of sight quickly enough - to set the next scene. This scene was timed by a musical number - which could not be elongated. Following this was a gauze, a cloth, also a change of borders and back cloth - all in a matter of seconds. This happened at Reading. Stage hands were unaccustomed to quickly handling. We are now due for Empire, Finsbury Park, after Leeds Empire, Empire Birmingham etc. This is a very nice theatre and well managed. We have a very good week. I have now taken on the duties of the electrician - owing to his being homesick. He left at Manchester and I could not find a suitable substitute and head office seemed to be satisfied that I should take on this extra task. Left - Programme for the Finsbury Park Empire 1939 - Courtesy Brian Kendal. 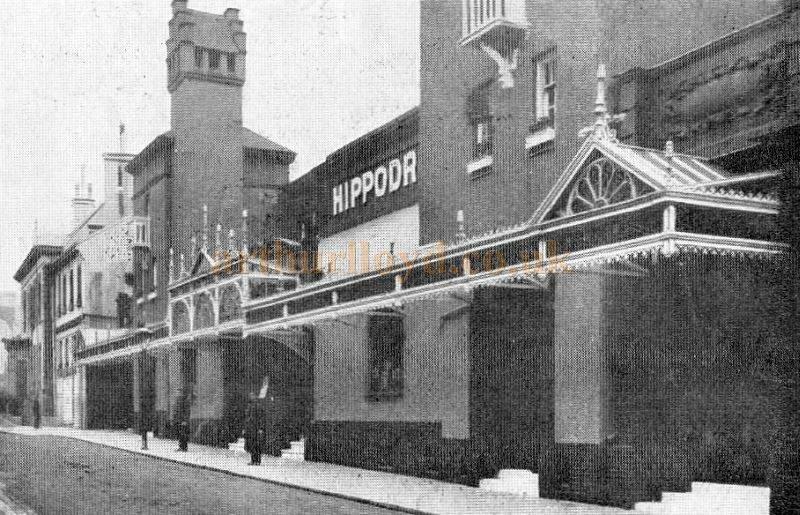 The Hippodrome, Golders Green, was our next date. Here the Tiller troupe of dancers were given an entirely new set of dresses. A certain amount of new scenery and the show was in excellent condition. We had a series of arena lamps that were hung in vital places to pick up - or catch each actor in an important pose or attitude. This was done ready for the opening but Mr. Jack Payne, during the afternoon, wanted them shifted into different positions. I pointed out the difficulty at this time of the day but Mr. Payne would not yield. A few cross words and I gave my notice in - to finish at the New Theatre, Cardiff. In our week at Golders Green, I met my dear old friend - Lily Morris and Archie. Miss Morris lived in the same boarding house as I did - on my visit to Liverpool in 1897 and was the Principal Boy at the Grand Theatre, Woolwich - "Puss-in-Boots" 1901 - 02. We had a long talk of olden times. Without further incident we arrived at Cardiff. Our week was again a big success and an extra matinee was given to cope with the crowds. My successor arrives on Tuesday. He has, therefore, five more days than I, to thoroughly "digest" `Navy Mixture". I am sorry to say that the author of "Navy Mixture", Mr. Lewis Marks, died suddenly. Authors and script writers seem to me a very unassuming set of people. I have met only a very few - especially those who have made successes. Mr. Lewis Marks - familiarly known as "Lew" was a very unpretentious sort of man and yet he was a brilliant man in many of his pursuits. He was a very excellent producer of revues - including "Navy Mixture" He wrote the book too. The result was an undoubted success. If you trace many of the shows and productions mentioned in this book - he was the author and producer to the pantomime "Babes In The Wood" at the Imperial, Brighton 1941 - 42 - coupled with the arduous task of producer. He also wrote the pantomime "Jack and the Beanstalk" which I staged at the Hippodrome, Wolverhampton. I must give my old and esteemed friend a bouquet. Although he has "departed", he will always be treasured in my memory. There was nobody to see us off by the train - for the company had already departed and were on their way to Southport. Our direction was just the opposite. From Cardiff to Bristol, Southampton to Bournemouth. I felt that this must be the end of the road. I assure you that there are many other facets of my life which could open and disclose a little affair - such as my early days with a "ghost show" at Barking and my part in opening a small music hall at Erith - but it does not cover a connected story. 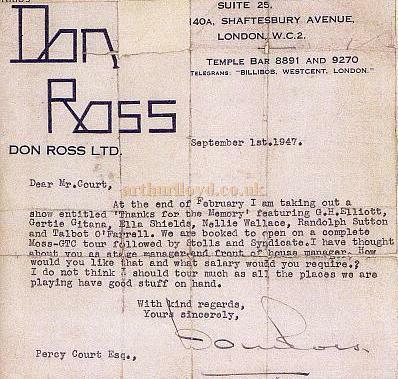 Right - The Letter from Don Ross Ltd to Percy Court offering him work as stage and front of house manager on the tour of 'Thanks For The Memory' in 1947 - From Percy's Diary. For the minute, I was struck dumb. The next - thrilled - with the knowledge that someone still thinks of me and with that, any feeling of morbidness or stagnation disappeared in a flash For Mrs. Court - she too helped me, for she also wanted to be amongst the people of the theatre and especially, if the artists in this letter were really all gathered to be in one show. It did not seem possible. However, I was not going to miss a chance like this and I dispatched my letter of acquiescence. I stated my salary etc. and then awaited the desired contract and to follow with the confirmation - I walked about on air. It is nice to think that I was still in demand at the age of seventy. A few weeks went by - when I received a letter from Mr. Bertram Montague enquiring whether I was free for pantomime at Christmas ? An early reply would be appreciated. I replied saying that I would like to work for him - if he could give me a pantomime booked for a short run - as I was "pencilled" for a show that was to be opened in February. 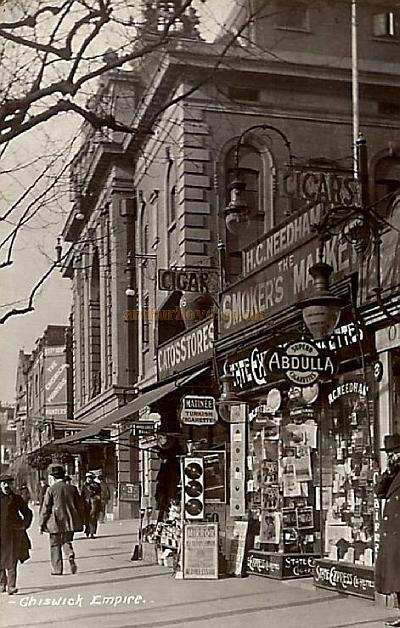 Then in a few days, I received letters and contracts and soon after the contracts were signed with confirmations, a pent-up urge to be amongst it all - even to live in London or view it getting glimpses of the theatres "from the outside". This was the irresistible feeling which came over me. My wife agreed - we again took the road and journey up to London and back again to Catford. Why Catford ? Well - it is easy of access. My "digs" were homely and the dear old landlady - well, I treat her as one of my oldest friends. We go to town each day. Meet a few of the "old timers" etc. Then I receive a notification from Bertram Montague to be at Wardour Street on Thursday at 11 a.m. to receive the details as to rehearsals for the pantomime at Wolverhampton. The Sunday following, we board the train from Euston and arrive at Wolverhampton at 2.30 p.m. Everybody was called for rehearsal at 10 a.m. Monday. Dutifully each and all were there before the appointed time. Theo Hook was the producer - he also played The King. Everything went well. Our principal comic was safe in getting "belly-laughs" - Billy Danvers. Bert Brownbill played Dame - he was rather unfortunate to have an accident on a Sunday which may have had a serious ending. After playing golf with Ernest Arnley, he engaged a taxi to take him home. The taxi was just turning left from a roundabout near Wolverhampton Station when a bus and an army vehicle were involved in a smash. Bert Brownbill was taken to hospital with a bad scalp wound. Theo Hook deputised for him and doubled his own part with great success. I personally went to the hospital for three visits and was able to obtain his discharge - after consultations with the head surgeon. Our pantomime ran five weeks and I brought back to London the company etc. Mr. Montague gave me praise in everything. I now have only a week to ready myself for Mr. Don Ross with his wonderful variety combination 'Thanks For The Mernory". 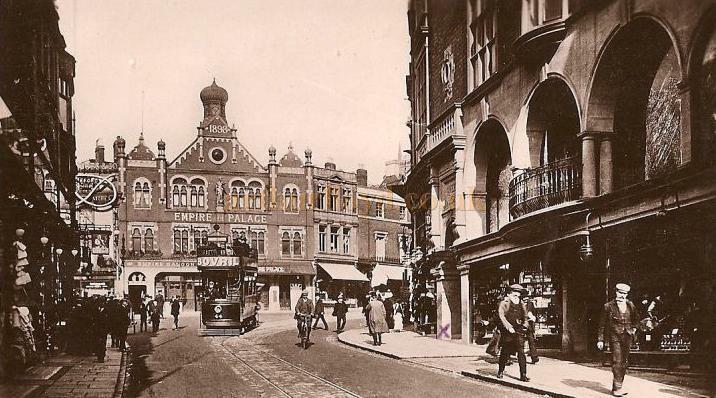 The rehearsals were at the Grand Theatre, Clapham Junction. On the Saturday prior to the opening, there had been a terrific snow storm. The snow was falling so thick that it was impossible to see across the road. Buses and trams were head-to-tail at Camberwell Green. After the rehearsal it took three hours and twenty minutes to make my way home from Clapham to Catford. 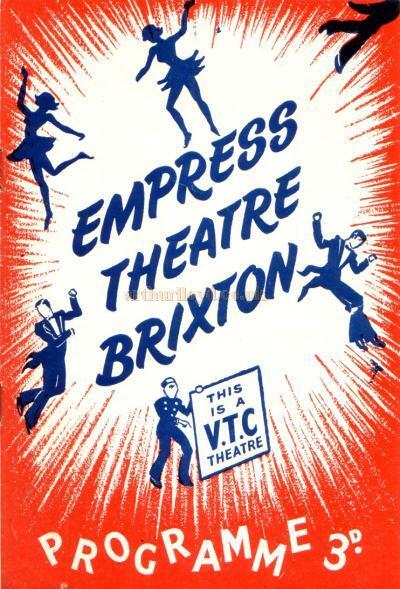 Then - on Monday, February 1948, we opened at the Empress Theatre, Brixton. Full band rehearsal on Monday passed off similar to many that I had before. The gallery of the Empress had been closed for some reason and it was still closed at the opening performance. Every bookable was sold-out (although the snow was knee deep outside) and actually, hundreds of would-be patrons were turned away. The gallery was opened on the Tuesday and literally, thousands were turned away. Every vaudevillian in London clamoured to see this remarkable combination. On Wednesday onwards, special police augmented with mounted police were there to govern the crowds. The Empress, Brixton, is situated a hundred yards or more from the main road - yet all roads were blocked with people on the Saturday it was indeed a week in show business. Left - Programme for the Empress Theatre, Brixton - October 17th 1955. 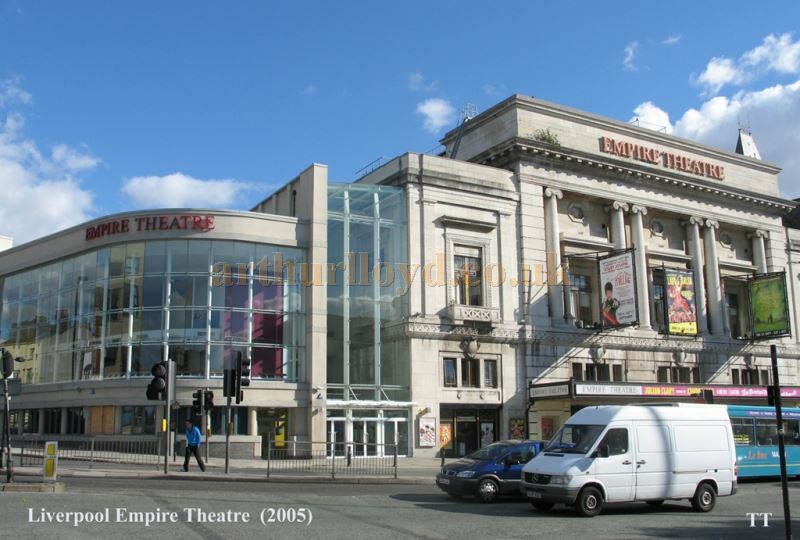 A telegram from the manager of the Empire, Liverpool told us that this vast theatre was sold and that is twice-nightly. Wires were humming with telegrams out for the entire week phones were shouting: "Hallo, Hallo - are you there - what's cooking ?" from managers up and down the country. How did this all come about ? Each lady artist at Brixton were handed up bouquets at every performance, whilst on Saturday - it was like a Gala at Covent Garden! And so we left Brixton for Liverpool. The press representatives were at Euston to see us off. The stars all travelled first class each week. The original booking was Empress, Brixton, Empire Liverpool, Empire, Sunderland, Empire, Newcastle - (vacant Holy week) but Mr. Don Ross was prevailed upon to fill this week by returning again to the Empire, Liverpool. This augurs well for future bookings. Crowds surged the streets adjoining the Empire, Liverpool - and in Nelson Street, it became impassable. Artists leaving after the show were pressed for photographs, autographs - and then, to show their "friendship", some of the more exuberant fans sat on top of their cars, giving vent to their favourite choruses etc. And so the week went on and we arrive at Sunderland. It is not quite the same enthusiasm but nevertheless every seat was sold out. The Mayor inviting the stars to lunch, whilst the press reports say that Sunderland had never witnessed anything comparable - within memory. Our next stop was the Empire, Newcastle, and here again it is a wild repetition of press, rotary club, with invitations to dinners and suppers. Miss Gertie Gitana had the misfortune to lose her voice - this was perfectly understandable - it was due to the sudden strain which brought about the inevitable larynx trouble. However, Miss Gitana appeared with G.H. Elliott in his "Laguna' number. 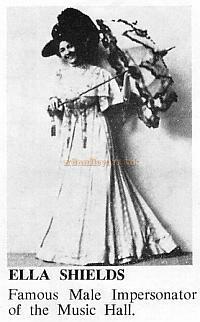 Right - Gertie Gitana - From a programme for 'Music Hall at the Palace' at the Palace Pier Theatre, Brighton. The usual crowds besieged the stage door after the last performance and crowds were at the station to see us off to Liverpool on the Sunday. We are again at the Empire, Liverpool. Crowds met us previously at the station to welcome the artists. Throngs of people everywhere - waiting to get a glimpse of the seven scintillating stars. These few words cannot describe in numbers the thousands which milled in and out, threatening to pulverize the traffic of this great city. The theatre is again sold-out - not a seat available. Nellie Wallace had a telegram, urgently advising her to return to London, owing to her daughter's serious illness. Mr. Ross wired that a deputy would be sent at once and that popular pair, Rene Houston and Donald Stuart arrived at Lime Street Station at 6.50 p.m. and they were "made-up" and on the stage at 7.20 p.m. If there is anyone in the world who has got more "attack" or to "sell" her goods than Rene Houston -well, I have never met them. She has no equal. The applause was terrific. Left - Nellie Wallace - From a programme for 'Music Hall at the Palace' at the Palace Pier Theatre, Brighton. Of course, we missed our Nellie and it was a great disappointment to our audiences but we were indeed fortunate in securing the services of that inimitable pair - Rene Houston and Donald Stuart. Needless to say, Gertie Gitana's "Nellie Dean" was sung with gusto by this great audience. Likewise, "On Mother Kelly's Doorstep" had a great following and Talbot O'Farrell was at his best in "That Old Fashioned Mother of Mine". I am convinced that Liverpool will wait many, many more years before this will ever happen again. We are due on the following Monday at the Empire, Sheffield. Miss Nellie Wallace arrived early for rehearsal on Monday and she was in good spirits. Her rendition of `Next Sunday Morning Is My Wedding Day" brought the house down. The bouquets were handed up to the ladies and these were sent to local hospitals afterwards. My digs at Sheffield were not to my liking so after the last performance on Saturday night, I left by the night train for Glasgow. The Moss Empire booking managers now feel confident that Don Ross's show can be booked for a fortnight in the large towns - and here at Glasgow, we stay for two weeks. The "Thanks For The Memory" company are used to big crowds but it seemed that their magnetism was even more pronounced. Throngs of people surged and swayed in the streets - to catch a glimpse of one of their favourites passing through the stage door - in defiance of the police. We were sold out of every seat on Tuesday for the whole fortnight - yet the crowds were there just the same. A large iced cake which must have weighed thirty pounds - with lettering "Welcome Back To Glasgow" was handed up to G. H. Elliott after the singing of his old number "Lily of Laguna". This is only one instance of our star's reception. It was much the same for Randolph Sutton and Billy Danvers - but where did all those beautiful bouquets come from in Scotland - for Gertie Gitana, Nellie Wallace and Ella Shields? Right - G. H. Elliott - From a programme for 'Music Hall at the Palace' at the Palace Pier Theatre, Brighton. On the Sunday following our first week at Glasgow, Mr. Don Ross invited the entire company to a coach tour of the three lochs - Loch Lomond, Loch Long etc. We started off at 10 a.m. from the stage door of the Empire Theatre, through Dumbarton, and Balloch - where we sat down to lunch. It was a beautiful trip - coupled with a fine and sunny day. We stopped at a hotel at Tarbett for tea - then gradually viewed the lakes from different viewpoints - arriving back at 8.20 p.m. A grand day which everyone appreciated. From Glasgow we travelled to Edinburgh - to arrive on a hot sunny day - although it was April 19, 1948. The anniversary of my birthday so to celebrate, we had a "do" at the Old Waverley Hotel in Princes Street. We are playing at the Empire Theatre and we are showing to packed houses. The Lord Provost of Edinburgh inviting the stars of the company to a banquet. Other invitations were from the Rotary Club, Masonic and other civic bodies. Among the duties of which it was my pleasure to perform was the coffee stall keeper in a scene with Ella Shields - with that immortal musical number "Burlington Bertie From Bow". I am sorry to record that - later - and after the Empire, Nottingham, the coffee stall was cut out. Still, I am very happy to say that I was included in this famous song scene. Left - Ella Shields - From a programme for 'Music Hall at the Palace' at the Palace Pier Theatre, Brighton. The Empire Theatre, Edinburgh, was burnt down about the early spring of 1917. That great showman and illusionist - known as Lafayette - who met his death in trying to save the life of his pet dog -both died in this great fire. Before I leave Scotland, a word or two of praise is due to both stage managers - here in Edinburgh and in Glasgow. Both theatres have stages that can mount the largest travelling productions whilst the staff are equal to meet all demands. I have a feeling for Mr. Whiston of Glasgow - a great stage manager and a leader of men - for he commands a very excellent staff "back-stage." On Sunday we leave Scotland - and Edinburgh for that great industrial town of Yorkshire Leeds. Somehow our advance publicity went astray but this was remedied by surging crowds trying their best to obtain a seat at the Empire. This advertises itself - whilst the show was just a repeat of its former triumphs - the seats were all sold out by Tuesday. The personality of this wonderful array of variety stars - stormed Leeds. On Saturday night at the Empire, Leeds - the National Anthem was sung right through - a great finish. Tears could be seen streaming down many of their faces.. and so the show moves on to Birmingham. Here we are to play a fortnight at the Hippodrome, Birmingham. Bertie Adams is the well-known manager to greet the company. There was no mistake here. Crowds were at the station to salute and receive the company. This again assured us that Don Ross's show had the advance publicity and the citizens of Birmingham responded. On Monday morning the representatives of three local papers were at the theatre during rehearsals - where they took "shots" and gave tribute by giving a graphic account of all that they had seen - in their respective journals. But we are sad - for Miss NellieWallace had to return to London immediately - her daughter was again taken seriously ill and later, she passed away. It was a blow that Nellie Wallace took - for from this date, Nellie gradually faded. Her act was replaced by Manley and Austin - a mixture of music and acrobatics perhaps better described as a "pot pourri" act. Again it is a repetition - this vast theatre is sold-out for the entire fortnight. Unfortunately, I was taken ill on the Saturday evening - which resulted in my being an absentee for the last performance. The doctor described it as something that I had eaten which caused the trouble. My indisposition was of short duration although during the travel to London on the Sunday, I again felt uncomfortable. However, on Monday I am again my usual self, to superintend the rehearsal at the Empire, Finsbury Park, and here I am pleased to add Miss Nellie Wallace was welcomed by all the company on her return - each trying their best to cheer Nellie, whilst Nellie was endeavouring to make her public laugh. 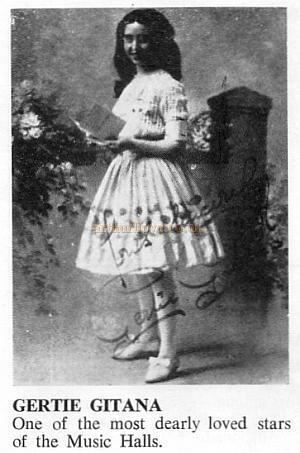 Right - Nellie Wallace - From a programme for 'Music Hall at the Palace' at the Palace Pier Theatre, Brighton. Everybody wanted to help and understand her "non nobis solum" - "not merely for ourselves". To her audience she was - Nellie Wallace. We are here for a fortnight. 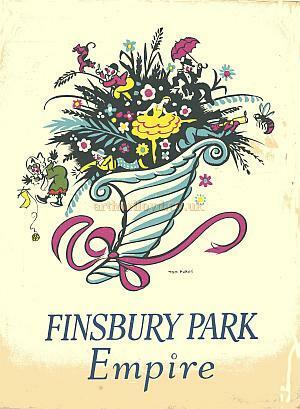 The flowers, the crowds and the cheering was again linked to the events of the towns which came before Finsbury Park. We all looked upon it as a sure thing - nothing could mar our reception - because it was always without incident or any clouds - on this triumphant run of "Thanks For The Memory". Yes - but here at Finsbury Park it was a real Londoner's welcome - a salute with a "patois" suggesting the love of the "cockney" in their own language. As G.H. Elliott appeared - a voice shouted: "Wot cher me old brown son!" It was a Londoner's true welcome. Miss Ella Shields, who always put over her numbers in such an inimitable manner that destined her to be the worthy successor to Vesta Tilley. She certainly seemed to be at her zenith at this theatre - although later on at the London Palladium she eclipsed herself. I had a phone message on Thursday from Kingston Empire. Mr. Harry Dean, resident manager, was seriously ill. A member of the staff - knowing I was at the Empire, Finsbury Park - sent this call through - hoping that I could spare the time to visit my old colleague in hospital at Hampton Hill. On the Sunday between each week of our visit - Mrs. Court and myself were at the hospital. The medicos had just given Mr. Dean oxygen. After a wait, we were admitted. It was a very sad meeting. He had changed so much in appearance but we tried to cheer him. I was associated with Harry Dean - just thirty years. Some weeks later, he "passed on". This Saturday ends our visit at the Empire, Finsbury Park, and is another milestone in the records of our successful show. "Thanks For The Memory" was built for the masses. The people of this island gave full proof - by regular "full houses" without exception - from its inception at the Empress Theatre, Brixton. The Saturday evening was like a Gala Night. Visits of famous stars included Sophie Tucker, Albert Whelan, Jane Ayr, and the chief of the London Palladium, Mr. Val Parnell. Again we move - to the historic town of Nottingham - in the Midlands. All the artists were in good form - with perhaps one exception - a cycle act, Nichol and Martin. 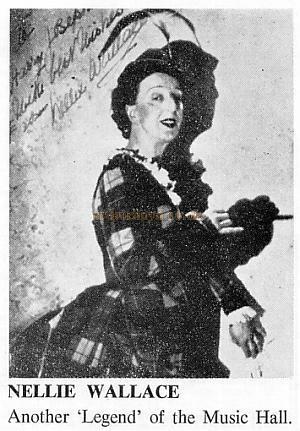 Harry Nichol, who had many falls in his "Humsti Bumpsti" performance, hurt his back - but he continued as if nothing had happened. We are at the Empire, Nottingham, two weeks and here the same success continued. A never-ending stream of invitations from the civic heads, whilst the local press acclaimed it: the best show in years. The show is booked for two weeks. Our artists now desire a holiday and so, at the closure of the last performance at the Empire, Nottingham, we have a vacation of three weeks. 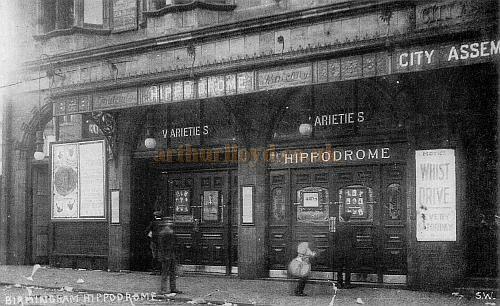 Left - The Brighton Hippodrome Auditorium in 1910. During my stay at Nottingham, I had a visit from an old war-time comrade, and music hall artist - Jack Kirk from Lincoln. 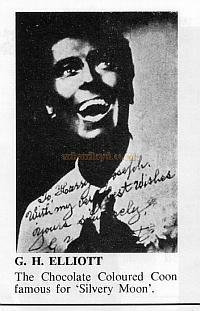 He was in our concert party in France during the 1914 war. The same animated scenes were in evidence during our two weeks at Nottingham, and at the close - Auld Lang Syne was sung and then - on Sunday - each travelled in a different direction. A last minute telegram indicated that the opening date after the vacation will be - to delete Brighton and supplant - the London Palladium! Here was a "bombshell". Whilst at Finsbury Park Empire, the company was offered The Prince of Wales Theatre, Coventry Street, W.C. This was turned down - because the artists felt it would not feel at "home". One remarked "Horses for Courses" but here. The London Palladium will be a different story - we hope. Mr. Don Ross ordered a mid-week rehearsal during the vacation's third week and so holidays will be curtailed. From Nottingham we travelled via London and arrived at Brighton at the same hotel as Miss Alice Lloyd and Daisy Wood (of the famous Lloyd family). Brighton is a town in which the unpredictable happens. Should you sit on a seat on the promenade, you are sure to meet someone you know - perhaps a friend of your youth. Yes - that is what happened to me which recalled certain incidents - then cemented our renewal by having "one" at The Ship opposite. I had already fixed for five weeks at Brighton and I had to compromise by a share of rent due to the Palladium booking. We were required at the Palladium for two rehearsals - this entailed journeys to and from town. The day came - crowds jammed Argyll Street - even as far as Oxford Street or from Regent Street. The bill was topped by an American act - Edgar Bergen with other supporting acts. These preceded and finished the first part of the programme. 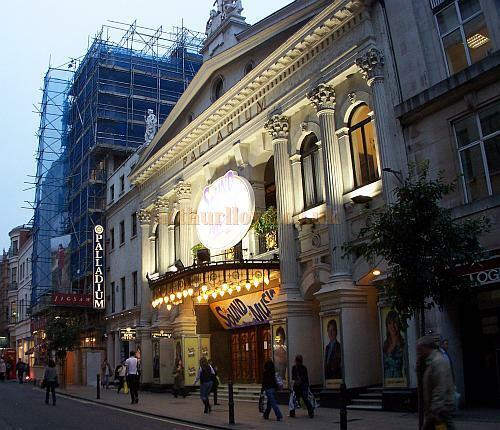 Right - The London Palladium during production for 'The Sound Of Music' in October 2006 - Photo M.L. It was very plain that the audience had come to see our show "Thanks For The Memory". As soon as the number went up at each side of the proscenium - from a growing hum - came a wild ovation and cheering. This wonderful theatre provided each artist with a setting which was most applicable to their song or act - whilst the "Tout de Ensemble" was the effort of Charles Henry. 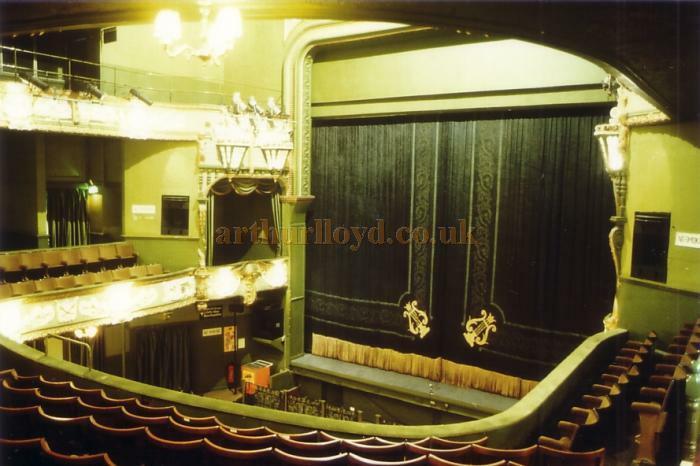 A rostrum two feet high - its length covered the same as the proscenium opening - whilst its width was about ten feet. A refectory table of oak at least twenty feet long topped the rostrum and seven Glastonbury chairs adorned the sides and back. The table was set with silver fruit bowls laden with fruit. Other decorations were beautiful candelabrums and also large candelabras. Mr. Val Parnell supplied champagne for the fortnight which was used at the Grand Finale - toasting each, the audience and to themselves. The scene was in heavy black velvet. Whilst the toasting was in progress, the rostrum was propelled in its entirety from the back of the stage to the footlights and "vice-versa". All the stars - G.H. Elliott, Gertie Gitana, Nellie Wallace, Ella Shields, Talbot O'Farrell, Randolph Sutton and Billy Danvers standing or sitting at the table. The curtain rang down to a wild and enthusiastic audience - clapping and cheering. One of the most beautiful sets was a column set with drapes in which Gertie Gitana performed her song scene, Miss Gitana looked lovely in a rapturous dress - that was in beautiful harmony with this scene - whilst I must record that Gertie was in top form - and this was reflected by the many "curtain" calls at the finish of her act. The flowers that were sent up - were again despatched to various London hospitals each morning. Mr. Val Parnell has placed a brass (burnished) plate on a plinth at the dressing room door of each star artist. At the end of the engagement this is again taken from the door and, as a memento, Mr. Parnell presents each of these top ranking artists their plates to commemorate their visit at the London Palladium. Our visit is for two weeks. I personally had a very happy time and will treasure the memory of the theatre and its very capable staff, It would be egotism to repeat all that happened during this fortnight but I assure you that the scenes with the ever-increasing throng of people was a revelation to me. I feel that the success must have been in the laying out of this vaudeville programme - which had the effect of exciting its audience with emotion - due to the careful planning of Don Ross. Left - Variety Programme for the 31st of December 1928 at The London Palladium, directed by George Black. The dressing room accommodation was commodious - having every thing that the artist could wish for - large arm chairs and couches installed in most of the rooms - whilst wardrobes with suitable hangers were plentiful. Each dressing room was decorated - thereby the comfort of the artist was assured. And now we say Good Bye to the London Palladium and we depart from Paddington to Cardiff- to, open at the New Theatre. I am not going to repeat, by reiteration, but I must say - yes, it was exactly the same in every aspect. On the Saturday evening I had an accident. I hurt my back but I carried on. We only play one week at this theatre but we did great business. From Cardiff - our next call was at that beautiful theatre of Manchester - The Palace. It is for two weeks. The people of Manchester seem to me all trekking South, or to Blackpool for their annual holidays. Every train is packed and we wondered - what effect it would have on our show at this vast theatre. We were expecting a reverse - but no - it was packed out for the fortnight. The press acclaiming it - the show of shows. G.H. Elliott - who is a great favourite here - could not leave the stage - owing to the din. More, more and encore - it was the Palladium all over again. As I do not feel too well, I made arrangements with Mr. Don Ross to leave the company after the week at the Regal Theatre, Great Yarmouth. It was a wonderful fortnight again. The flowers were sent each morning to the womens' hospital which is exactly opposite the Palace Theatre in the Oxford Road. 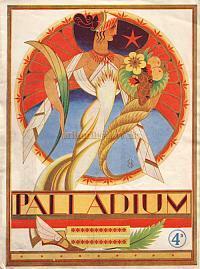 Right - Programme for the Palace Theatre, Manchester - Courtesy Peter Charlton. During our stay, G.H. Elliott kept up a celebration with his most intimate friends - and so, Good Bye to Manchester. Owing to the crowds leaving London Road station, Manchester, during the daytime, Mrs. Court and I travelled cross-country to Great Yarmouth via Peterborough. It was an irritating journey - for the train stopped at small stations - where there was no restaurant or any other facilities. We had left London Road about midnight - it was nearly midday before we arrived at Great Yarmouth. The Regal Theatre is a large cinema at the top end of the town and there were some shortcomings - judging from that standard which had hitherto been given to the company. This theatre had a lack of dressing rooms, also a makeshift of scenery and curtains therefore, the artist was not so comfortable and this was reflected in the performer's presentation. However, it did not harm the business. We played to capacity throughout the week - and from here I leave this famous company. Mr. and Mrs. Don Ross were very good to me and I thank him for his magnanimity Mrs. Court and I hill never forget our engagement with "Thanks For The Memory". I trust you have enjoyed my little offering - I thank you." In due course we arrived in London. We stayed in town for two weeks - then we took train for the South of England and here I am at the town of Bournemouth. Mr. Court concludes: "To my readers - I have enjoyed writing these memoirs and I trust it has afforded you some little pleasure. After an association with the theatre over fifty-two years. Thank You. Percy G. Court October 1 1953. (c) Percy G. Court, 1 Bodorgan Road, Bournemouth, Hampshire. 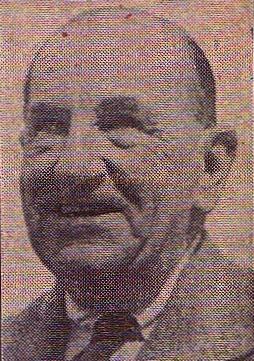 Right - Percy G. Court - Stage Carpenter, Theatre and Touring Company Manager for over fifty two years, and the writer of this article, 'Memories of Show Business,' in 1953. This entire article; 'Memories of Show Business' by Percy G. Court 1953, was transcribed from Percy Court's original Diaries and was very kindly sent for inclusion on this site by Stephen Wischhusen.